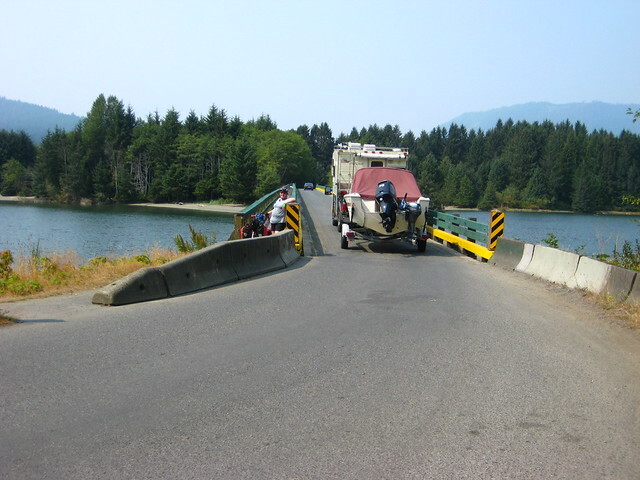 The Pacific Marine Loop is one of a number of designated scenic/tourist routes here in British Columbia; it starts in Victoria, heads west through Sooke to Port Renfrew, then goes inland to Lake Cowichan before coming back to Victoria via Duncan and either the Malahat highway or Brentwood-Mill Bay ferry. What’s it like as a bike touring route? Pretty good, with some important caveats! First, there is basically no shoulder on BC Highway 14 anywhere west of Sooke. Traffic isn’t usually that heavy and most drivers are courteous, but if you’re only comfortable when there’s a shoulder, this might not be the route for you. Services west of Sooke are minimal until you get to Port Renfrew or Lake Cowichan. There are no grocery stores outside of those three towns, and places to get water can be few and far apart, as well. Finally, there is no cell service from just west of Sooke until you’re back in Cowichan Lake. So: carry three or four days of food leaving Sooke or Cowichan River. Carry a water filter, water treatment pills, or some other method of ensuring your drinking water is safe. Navigation isn’t difficult – often there’s just the one paved road – but an offline map app or actual GPS unit is useful, or even a good old-fashioned paper map! We left Victoria for Sooke Potholes campsite (previously) with a day’s worth of food. I’ve written up Potholes before, it’s a really nice campsite and one great feature is that the folks managing it have an unofficial “no turn away” policy for anyone showing up self-propelled. Even if all four tent pads in the group hiker-biker site are full they’re OK with you putting your tent elsewhere in that group site. It makes things easier, especially when you start your trip, like we did, on a long weekend and campsites are often full. 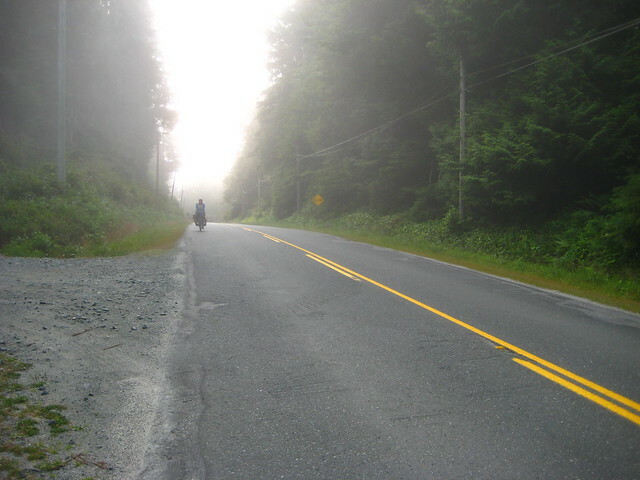 The second morning we headed into Sooke proper via Sooke River Road and Hwy 14, delayed by a flat tire on my girlfriend’s bike. We stocked up on food at one of the supermarkets in Sooke and ate lunch at the very tasty, very friendly Route 14 Diner right in the centre of the town. Because we’d been delayed leaving Sooke we stopped for the night at French Beach Provincial Campground after about a 33km day, instead of our planned original destination of China Beach Provincial Campground. French Beach turned out to be an inspired choice, as it’s got much better beach access than China Beach and there’s an additional ugly hill in and out of Jordan River before you get to China Beach that we did when fresh the next morning! Partway between Sooke and French Beach is the district of Shirley; there’s no town but the amazing little coffee shop there called Shirley Delicious which is well worth stopping at. You’ll need the refreshment after the long, steep climb into the town from either direction! Jordan River used to be a little waterfront hamlet but these days there’s basically no residents left; they’re being bought out because of the flood risk from a dam up the River Jordan if/when we get a big earthquake in this part of the world. There’s a cafe there still – the Cold Shoulder Cafe – but it might well be closed in the near future, I’m not sure! There is still a CRD campsite right on the beach, as an alternative to the two provincial campsites a few kilometres away either side. There’s a serious lack of landmarks or much of anything else between China Beach Campground and the village of Port Renfrew. There’s a number of steep descents and climbs where the road goes down into river valleys; you can get access to fresh water (treat it first!) at a few places, including the Loss Creek bridge. You’re inland away from the ocean for this whole stretch, but some of the views out across the Pacific are really spectacular! The hill into Port Renfrew is the longest by far of any of the climbs or descents we’d had so far; we wound up pulling over partway down just to give our hands and our brakes a rest! Rather than go into the town proper we turned right and crossed the long single-lane bridge over the San Juan River, went through the Pacheedaht First Nation (there are several camping options here, and loads of other lodging options in Port Renfrew itself) and headed upriver and inland a few more kilometres to the Fairy Lake Recreation site, a nice quiet ex-Forest Service campground. Great swimming here, but be mindful that services in these campgrounds are minimal. You’ll need to pack your garbage out with you, and treat the water you get yourself from the lake – no garbage disposal or potable water is provided. French Beach to Fairy Lake is a solid 55km day of riding, and we had more than enough food to not have to worry on that front, so the next day we headed just 10km up the road to Lizard Lake Recreation Site. This was the prize of the trip, with really nice walk-in sites next to the day use area, separate (and much closer to the lake itself) than the regular drive-in campsite. If you’re riding inland, go just past the campsite’s marked driveway to find the day use parking area; the walk-in sites are just in from the day use parking and metres from the lake. Our fifth day on the road we set off fairly early to tackle the hills between the coast and Cowichan Lake. We’d heard mixed reviews of the climb, but I’m happy to report that while it’s a long solid climb, none of the grades are all that steep and we walked fewer hills in the day’s riding that we had on the day three slog from French Beach! Google Maps puts the summit at 472 metres (~1550ft) which is respectable but still a hill, not a mountain! There’s not a lot of shade on the climb or the descent, but especially on the Cowichan Lake side you can often get down to a stream from the side of the road if you need to top water bottles up. Once you get to the village of Mesachie Lake it’s just 5km or so of level riding to get to the town of Lake Cowichan (the lake is called Cowichan Lake; the town itself is Lake Cowichan. Clear like mud, right?). We stayed with friends here, but there are a number of camping options nearby, including Lake View Campground operated by the town itself. There’s a couple of places in the centre of Lake Cowichan for food and ice cream, and we felt we’d earned those sundaes when we rolled into town! From Lake Cowichan you’ve got a number of route choices to get to Duncan and beyond. We tried out the Cowichan Valley Trail from Lake Cowichan as far as Glenora, but with our loaded touring bikes the often-rough surface of the trail made for slow and uncomfortable riding. We left the trail at the beautifully equipped Glenora Trail Head Park and made our way by various side roads down to Mill Bay to get the ferry across to Brentwood Bay. It’s unfortunate that the Cowichan Valley Regional District has left the Cowichan Valley Trail as rough and unfinished as it is, as it could be a spectacular route if it were usable by a wider variety of bikes. We had intended to camp one last night at Bamberton Provincial Campground near the Mill Bay ferry landing, but decided to get an early evening ferry and have my brother pick us up on the Brentwood side with a bikerack-equipped car. Bamberton is a really nice campground, though, and we’ll stay there again! I have more photographs from the trip over on my Flickr account in my Pacific Marine Bike Trip, Summer 2017 album. Quick embedded Google Map. Pretty accurate for our route, including our diversion off the Cowichan Valley Trail at the Glenora trailhead. Should give anyone who wants to do this route themselves a good idea of the distances and such! Be mindful of lack of services, lack of cell reception, and lack of potable water anywhere west of Sooke. The route is incredibly straightforward, you’re not going to get lost anywhere, but carry four or five days worth of food leaving Sooke (or leaving Lake Cowichan, if you’re doing this loop the other way) and a reliable safe method of treating water. We just used water treatment tablets, one per water bottle, but sometimes the 30 minute wait to make sure the tablet had done it’s thing felt like a long and thirsty time! There is a general store of some sort in Port Renfrew, but we didn’t need to divert to it to restock so I can’t speak to how well supplied it is. Now that we’ve done it, would we do it again? Probably not this exact route, but we do want to get back to the two Forestry campsites behind Renfrew, Fairy Lake and Lizard Lake. We’ll probably go in via Lake Cowichan and come out the same way if we go by bike again, though. The climb is steep but easier than the long grind and traffic of the Sooke-Port Renfrew portion. That said, the views along the Sooke-Renfrew portion are totally spectacular out over the Pacific Ocean/Strait of Jaun de Fuca and going by bike is a great way to soak up that vista! Next Next post: The Field Only Armoury Project in Poster Form!